Lucas Oil’s automotive lubricants and additives are now available from over 120 motor factor branches within the Rapid Group, after a deal was agreed with the US manufacturer last month. PMF finds out more about the decision. In an evolving aftermarket, where supply chains and distribution patterns change almost as fast as products move off the shelves, distributors are increasingly aware of the need to bring in more of the brands that local garages want to use. 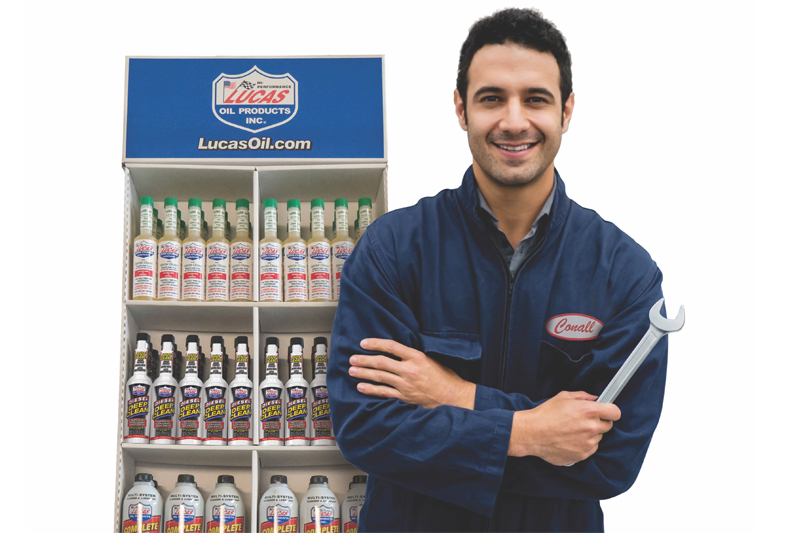 Lucas Oil suggests that – with its range of problem- solving additives – it is a good example of one such brand. “Whilst we will begin by focusing on a range of popular additives, our agreement allows us to purchase any lubricants from Lucas Oil,” said Rapid Group Chairman, Adnan Umarji. Lucas Oil’s additives range includes the wear protecting, engine dry-start preventing and universal oil conditioning agent known as Heavy Duty Oil Stabilizer. As well as improving miles per gallon and restoring engine power, the fuel treatments – such as Upper Cylinder Lubricant, Deep Clean and Diesel Deep Clean – are sold for their ability to remove tars and resins from injectors and from inside fuel systems. Demand is also increasing for the problem-solving range. These are additives that can save motorists hard cash and include Engine Oil Stop Leak and Power Steering Stop Leak. “There’s no doubt that our customers want additives that can help to solve specific problems. Lucas Oil has a great range of products that are easy to use and can help to fix some common problems by reducing the severity of most symptoms,” he added. There are no distribution vehicles liveried under the Rapid name. It might not be a distribution brand familiar to many garages at local level, but the profile of the Rapid Group among the world’s international component suppliers is extremely high. The eleven members are all independent businesses that pool buying power and share collective sales expertise. The move is delivering positive results. Up to ten new branches are expected to be added in 2019. Lucas Oil is coming aboard at just the right time – for both parties. The US manufacturer’s UK operation was actively looking for fresh opportunities in the automotive aftermarket. It has recently reorganised, and a new management structure is in place. It was actively trying to identify new supply routes into the garage network, so Rapid is a perfect fit. For more information on the products available from Lucas Oil, click here, and to find out more about the Rapid Group, click here.